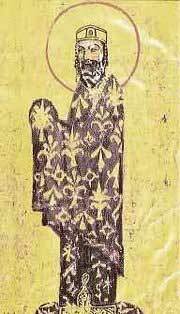 Alexius I (1048 – August 15, 1118) (Αλέξιος Α' Κομνηνός), Byzantine emperor (1081–-1118), was the third son of John Comnenus, the nephew of Isaac I Comnenus (emperor 1057-–1059). His father declined the throne on the abdication of Isaac, who was accordingly succeeded by four emperors of other families between 1059 and 1081. Under one of these emperors, Romanus IV Diogenes (1067–-1071), he served with distinction against the Seljuk Turks. Under Michael VII Parapinaces (1071–-1078) and Nicephorus III Botaniates (1078-–1081) he was also employed, along with his elder brother Isaac, against rebels in Asia Minor, Thrace and in Epirus in 1071. By that time Alexius was the lover of the Empress Maria Bagrationi, a daughter of king Bagrat IV of Georgia who was successively married to Michael VII Ducas and his successor Botaniates, and was renowned for her beauty. Alexius and Maria lived almost openly together at the Palace of Mangana, and Alexius had Michael VII and Maria's young son, the prince Constantine Ducas, adopted and proclaimed heir to the throne. The affair conferred to Alexius a degree of dynastic legitimacy, but soon his mother Anna Dalassena consolidated the Ducas family connection by arranging the Emperor's wedding with Irene Ducaena or Doukaina, granddaughter of the caesar John Ducas, head of a powerful feudal family and the "kingmaker" behind Michael VII. This coin was struck by Alexius during his war against Robert Guiscard (http://www.cngcoins.com). 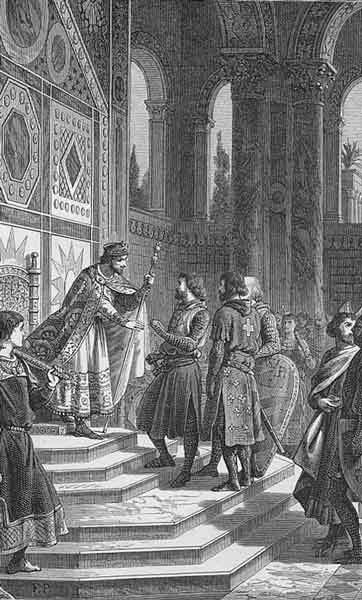 The second and much more serious host of knights, led by Godfrey of Bouillon, he also led into Asia, promising to supply them with provisions in return for an oath of homage, and by their victories recovered for the Byzantine Empire a number of important cities and islands—Nicaea, Chios, Rhodes, Smyrna, Ephesus, Philadelphia, Sardis, and in fact most of Asia Minor (1097–-1099). This is ascribed by his daughter Anna as a credit to his policy and diplomacy, but by the Latin historians of the crusade as a sign of his treachery and falseness. The crusaders believed their oaths were made invalid when Alexius did not help them during the siege of Antioch; Bohemund, who had set himself up as Prince of Antioch, briefly went to war with Alexius, but agreed to become Alexius' vassal under the Treaty of Devol in 1108. During the last twenty years of his life he lost much of his popularity. The years were marked by persecution of the followers of the Paulician and Bogomil heresies—one of his last acts was to burn Basilius, a Bogomil leader, with whom he had engaged in a theological controversy; by renewed struggles with the Turks (1110-–1117); and by anxieties as to the succession, which his wife Irene wished to alter in favour of her daughter Anna's husband, Nicephorus Bryennius, for whose benefit the special title panhypersebastos ("honored above all") was created. This intrigue disturbed even his dying hours.